I meant to post some of these pics earlier in the summer with an amazing blog post about how much fun Norton had playing in the city water park. I never got to it, so here’s a somewhat Wordless Wednesday to let the pics do most of the talking. Thinking about going in the water…. 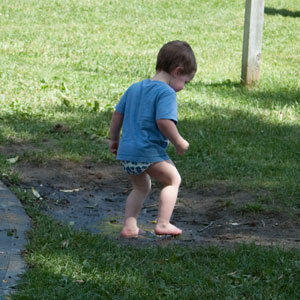 This was Norton’s first time being outside bare foot… and playing in the mud was remarkably interesting for him. Those are super great pictures!!! He looks like he is having a great time!